Okay. This is really cool! I recently came across some remarkable video of ants catapulting themselves around with their jaws. They’re jumping ants! While this behavior is not new to the insect world; I found it fascinating that the ants are not only able to jump backward, but have now evolved to jumping forward as well. This jumping forward is completely new to science! The ants are called Trap-Jaw ants, and when they snap their â€œtrap-jawsâ€ together super fast, it causes the ants to quickly bolt through the air. The ants featured above are called Trap-Jaw ants (Odontomachus). The footage was filmed in Borneo, although there are also Trap-Jaw ants found in the United States; particularly in the state of Florida. Trap-Jaw ants have a pair of huge pinchers, or mandibles, that have the ability of opening 180 degrees. Once opened, these jaws will lock into place almost like a bear trap. There are sensory hairs inside the mandibles that will snap shut the ant’s jaws shut when triggered. When this happens, the result is a jumping ant that can reach record speeds of 80-140 miles per hour (mph). This jumping or propelling behavior serves a couple purposes. Not only is it used to escape potential threats, but it also assists in catching other insects like termites and springtails. 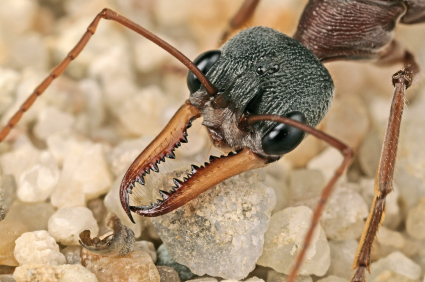 In addition to this ant’s trap-jaw self-defense mechanism, some Trap-Jaw ants can also unleash very painful stings. The above footage of Trap-Jaw ants is from a NC State PhD student, D. Magdalena Sorger. You can see her research at www.theantlife.com. Here is her Google scholar profile.